George Graham Reviews "Burlap to Cashmere"
With so many contemporary bands doing retro music of one description or another, one can pretty much pick a style from thirty, forty or fifty years ago and there's a good chance you'll find a newer group doing that kind of music and often doing it very well and with a good degree of authenticity. One thing that seemes to be relatively scarce among the revival bands is the kind of folk-rock made famous by Simon and Garfunkel. This week we have a very nice new recording that echoes that sound with a few new twists. 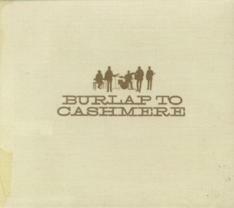 The group is called Burlap to Cashmere, and it's also the title of their CD. Burlap to Cashmere has been around for quite a while. They formed in 1994 when Steven Delopoulos was attending Marymount Manhattan College and was involved with a theatrical production, which was called Burlap to Cashmere. Delopoulos came up with the music for the show and asked his then-14-year old cousin John Philippidis to join him, and the band got it start. A childhood friend Theodore Pagano joined to play drums. They eventually landed some gigs at the famous New York folk club The Bitter End, and were signed to A&M Records which released their debut full-length CD called Anybody Out There. They later released a live album, and toured extensively in the late 1990s, after which then went into hiatus. In 2005 they were working on demos for a new reunion album when on the way home from the studio in Brooklyn, Philippidis was nearly beaten to death in a road rage incident. He was a month in a coma, required extensive reconstructive surgery, and a long rehabilitation. But Philippidis' recovery turned out to be an incentive for the band to reconvene. So last year, they went into the studio with producer Mitchell Froom, who has worked with people like Sheryl Crow and Bonnie Raitt, and began work on this reunion CD, with the goal of its being an honest band album, eschewing a lot of studio tricks. With the Greek heritage of the group's members, elements of Greek folk music find their way into the original compositions of founder Steven Delopoulos, but the preponderance of the sound is creative, thoughtful folk-rock with a lot of interesting musical ingredients. Though the image of the band on the CD and a poster insert shows five people playing, the credits list Burlap to Cashmere to be just the three original members, plus some keyboard contributions from producer Froom. And while they avoided a lot of studio effects, overdubbing is in evidence with the instrumentation often being a lot more than three at a time. Delopoulos' material is a real strength of the album. There are the kind of literate lyrics one expected back in the folk-rock days, the musical compositions are much more than three-chord folk-songs, and Delopoulos' vocals can sometimes be reminiscent of Paul Simon. Burlap to Cashmere the new reunion album by the band of the same name, is an excellent release by a group that is steeped in 1960s folk-rock but takes it an a lot of interesting directions including the addition of Greek folk influence. The group's original music is first-rate both lyrically and musically, their vocals are in the spirit of the folk-rock days, including their nice two-part harmonies. The various instruments played by the three members are tastefully handled. Mitchell Froom's production is also at a high level. Our grade for sound quality is about a B plus. The mix, by David Boucher is clean and sparing with the effects. The overdubbing by band members generally does not come across as overbearing or unnatural. But we'll deduct the usual points for the heavy-handed, mindless, herd-mentality volume compression that makes the music's quieter moments just about as loud as its strongest moments. There's a lot of good retro music around these days. While Burlap to Cashmere could be considered part of that movement, they add enough original touches, along with the bits of Greek folk music, that it makes the result both interesting and quite satisfying.